Many applications and games need to render in real-time realistic and very large natural scenes, potentially up to whole planets. This includes Earth browsers (Google Earth, Bing Maps 3D, Nasa WorldWind, Geoportail, Celestia), flight simulators, realistic games on very large terrains (Crysis, Fuel), etc. However, existing solutions providing highly realistic renderings are restricted to small domains and limited user movements, while those providing full navigation capabilities are less realistic and suffer from popping or other artifacts. There is not currently a virtual Earth model with real-time highly realistic rendering and animation, where users are free to move and look anywhere. The goal of the ANR project SimOne, for Scalable Interactive Models Of Nature on Earth, is to make a first step towards this long term goal. 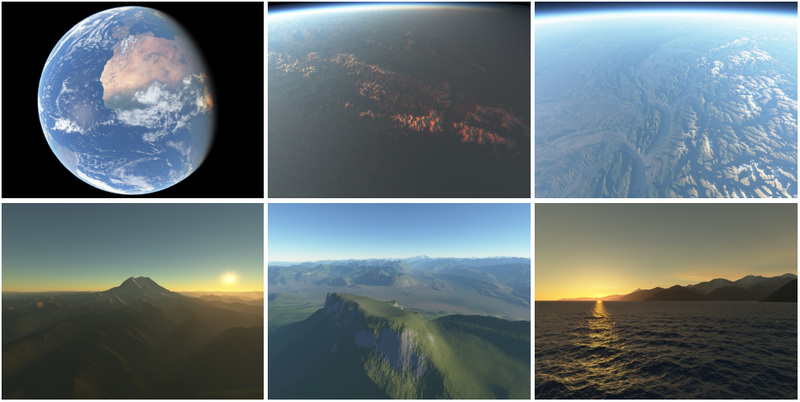 This project does not start from scratch, but from an existing virtual Earth browser prototype called Proland, developped at INRIA, and which can already render the terrain, the atmosphere and the deep ocean at all scales (see above teaser and links). In this context the subject of this thesis is to propose, implement and evaluate scalable models for the real-time animation and rendering of oceans. The existing real-time methods are limited to the deep ocean case. Other methods exist to reproduce the refraction and reflection of waves near shores, but they are not real-time, or to precompute propagation according to wind conditions. Likewise, methods to simulate breaking waves and foam are extremely limited. "Scalable" means that since the viewer can be anywhere on Earth, it is not possible to rely on global computations and storage, or even precomputations, and that input conditions (e.g. wind, current) might vary in space and time. So the animation and rendering must adapt to visibility and distance, without popping or transition artifact. In particular, the aspect at long distance must account for the effect of details that are too small to render (white caps, sea roughness). On the other hand, the goal is not to perform exact physical simulations, but only to get plausible animations, with some high-level handles that a user could control on desire. Procedural models and scalable representations, possibly to be invented, will be key ingredients to reach this goal. This subject allows to visit two aspects of computer graphics: wave animation, and shading of complex surfaces "materials". More details and bibliographic references about this subject can be found here. The student will benefit from the status and work conditions offered by INRIA at Grenoble and ANR project SimOne. He or she will also benefit from courses provided by the Doctoral School, and Summer Schools. He or she will be able to attend National and International conferences. M2R Master or equivalent in Computer Graphics. Theoretical skills in physics and practical skills in C++, OpenGL and GLSL would be appreciated but are not mandatory.